For those who are looking for a starter projector for home cinema viewing, Epson has introduced the PowerLite Home Cinema 600. This is a 3,000-lumen SVGA (800x600) LCD projector sporting a lower $359 price tag and some new enhancements like wireless connection, an auto iris, and horizontal keystone correction. These features price the Home Cinema 600 a few dollars more than most competitors in its class, but then, most competitive projectors at this price are DLP-based with 2x speed wheels that generate a lot of rainbow artifacts. 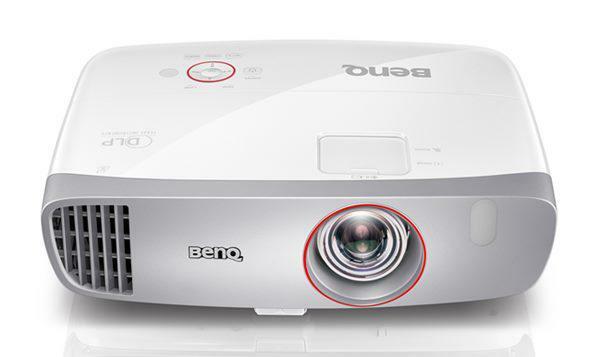 The Home Cinema 600 offers wireless projection using an additional cost LAN adapter. In combination with Epson's free iOS/Android app, this allows projection from a variety of wireless handheld devices. Data and video images are very good for a low resolution projector. At less than $400, the Home Cinema 600 is an inexpensive introduction to the joys of home video projection. If you already have a 16:9 screen, the first thing you will notice when firing up the Home Cinema 600 is that the projected image does not fit your screen. SVGA 800x600 is native 4:3 format which is the format of older televisions and classic films prior to 1953. When you show a 16:9 movie or TV show on this projector, you get black bars at the top and bottom. Assuming you intend to watch widescreen video material, you can set it up so that the black bars overshoot the top and bottom of the screen, and the 16:9 image fills the screen. You lose 25% of the projector's light output, and the image is created in an 800x450 matrix, but it looks more like a conventional home theater set up. By the way, this formatting issue is common to all SVGA resolution projectors. It is part of the trade-off for the very cheap price. When setting up the Home Cinema 600 it is easy to get the image perfectly rectangular regardless of the projection surface. Home video on a budget can include everything from a portable screen to a textured wall to a bedsheet, so the projection surface may not always be flat. The projector has three adjustments to square up the image: a simple slider bar near the focus ring for horizontal keystone correction, separate vertical and horizontal keystone controls, and a corner correction algorithm for fine tuning the extremes of the image. Considering the price it is surprising to see how good both data and video images look as long as you are not too close to the screen. You don't want to sit too close because the 800x450 resolution in 16:9 creates a pixelated screen-door effect. If you sit back from the screen by a distance of about twice the screen width, the visible pixel structure disappears and the image looks fine. Video images are very well color-balanced, and once brightness is reduced and contrast increased, they fairly pop from the screen. Flesh tones show no odd color biases, and the Home Cinema 600's 10,000:1 contrast ratio along with its effective and unobtrusive auto iris renders good detail in dimly-lit scenes. Data images are similarly impressive with good saturation and excellent focus across the entire screen. However, 8-point or larger type is recommended as clarity is compromised by the 800x600 resolution if you have to apply horizontal or vertical keystone correction. The overall brightness of the Home Cinema 600 makes it good for ambient light conditions. However, to get maximum brightness you will have to put up with moderate fan noise. In the middle of a football game, fan noise will not be an issue, but for that putt at the Masters, it might be a distraction. In that case, you should consider using Eco mode because, even though it lowers brightness by about 35%, that still produces about 1,200 lumens (16:9) in Living Room mode, which will be enough to avoid image washout in many circumstances. Kudos to Projector Central for another great review. Epson on the other hand is extremely lazy when it comes to their sub-1080p "home entertainment" projectors. This "home cinema" 600 is identical business model EX3220. Lazy. Like the 730hd, the aspect ratio is not 16:9. Obviously, svga is 4:3. But if epson is going to offer a very entry level home entertainment projector, it would be awesome if they made an 854x480 (480p) projector, then it would be 16:9. They could definitely still charge $359 and black bars wouldn't be there for standard 16:9 viewing. Future versions of the 730hd should actually be 16:9 and not WXGA (16:10). Slapping a different label on a business projector is lazy. Well said. Who in their rightful mind would use an SVGA projector in this day and age?